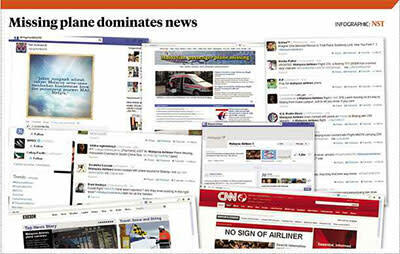 KUALA LUMPUR: NEWS of the missing plane dominated social media and news sites yesterday as people clamoured for updates. The incident also made headlines around the world, with extensive coverage on CNN, Agence France-Presse, Associated Press, Xinhua Agency, Reuters, BBC and The Wall Street Journal. Xinhua even had a microsite dedicated to stories about the missing plane, with reports pulled from Vietnam, China and Malaysia. By 5pm, there was even a Wikipedia page created for the airliner. All media outlets were giving hourly updates, with each debunking speculations and rumours as the day wore on. At one point, Xinhua announced on its Twitter account that Vietnamese rescue officials had found the signal of the plane, but Reuters flashed a report that Vietnamese maritime search and rescue coordination centre in Vung Tau said no signal had been picked up from the missing plane. CNN's Anderson Cooper interviewed MAS vice-president of operation control Fuad Sharuji, who said MH370 had seven hours of fuel, which would have run out by 8.30am. The network brought experts onboard to explain how a plane could go missing, as well as the mechanics and the technology of the aircraft. CNN's Piers Morgan tweeted: "Incredible in the modern age that a large hi-tech passenger plane can just 'disappear'. Praying for a miracle for the 239 people on board." Malaysian musician Yuna Zarai (@yunamusic) tweeted: "Woke up with terrifying news a Boeing 777 went missing on the way to Beijing. I fly the same route all the time. Ya Allah". By the end of the day, the three hashtags of #PrayforMH370 #MalaysiaAirlines #MH370" were trending on Twitter. MAS' Facebook page was flooded with comments, some inappropriate, some informative, but mostly expressing concern about the missing 239 passengers and crew members. Meanwhile, speculation continued to make the rounds online. To put an end to speculation and rumours circulating online and offline, acting Transport Minister Datuk Seri Hishammuddin Hussein, in the first press conference to address the issue, urged people to stop spreading unconfirmed reports. To prevent speculation, he said, the authorities would make updates through press briefings. "There were two speculations related to the missing plane: one, that said it had landed in Nanming, which is not true; the other, about the wreckage of the plane being found near an island to the south of Vietnam, which the DCA (Department of Civil Aviation) and Wisma Putra have confirmed as also not true. "I'm getting more confirmation through the military since the report named the Vietnamese military." He said he hoped that the public would understand that the authorities were being as transparent as they could and were giving information out as quickly as possible, "but we want to make sure the information has been verified using all the agencies available and that it is correct". CyberSecurity Malaysia chairman General Tan Sri Mohd Azumi Mohammed said the public should be more responsible when spreading news or engaging on social media, especially during distressing situations. He said speculating and bashing people online would create tension and confusion.